What if you could find out how to deal with those annoying gut issues? 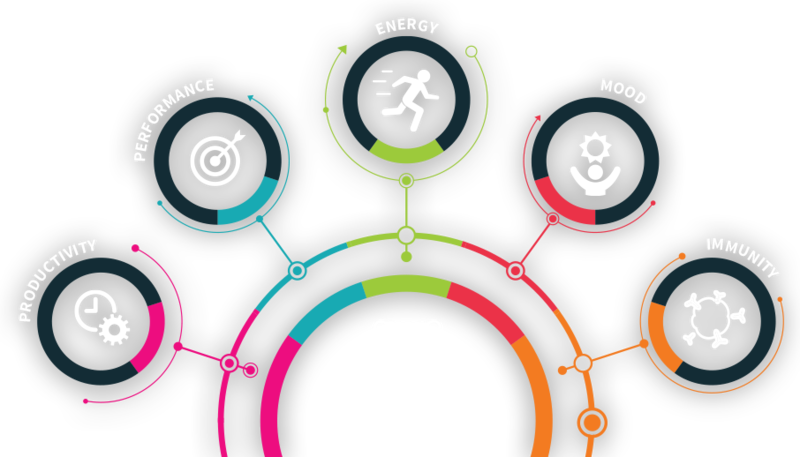 The Ixcela gut microbiome test reveals your gut health scores in five areas of health and then provides lifestyle recommendations on how to improve each score. Good gut health affects more than just your gut—it affects other systems of your body. Maintaining a balanced gut microbiome is critical for staying healthy. Imbalances in the gut microbiome have been associated with a wide spectrum of health issues. Like physical fitness, the fitness of your gut microbiome is critical to overall health and wellness. 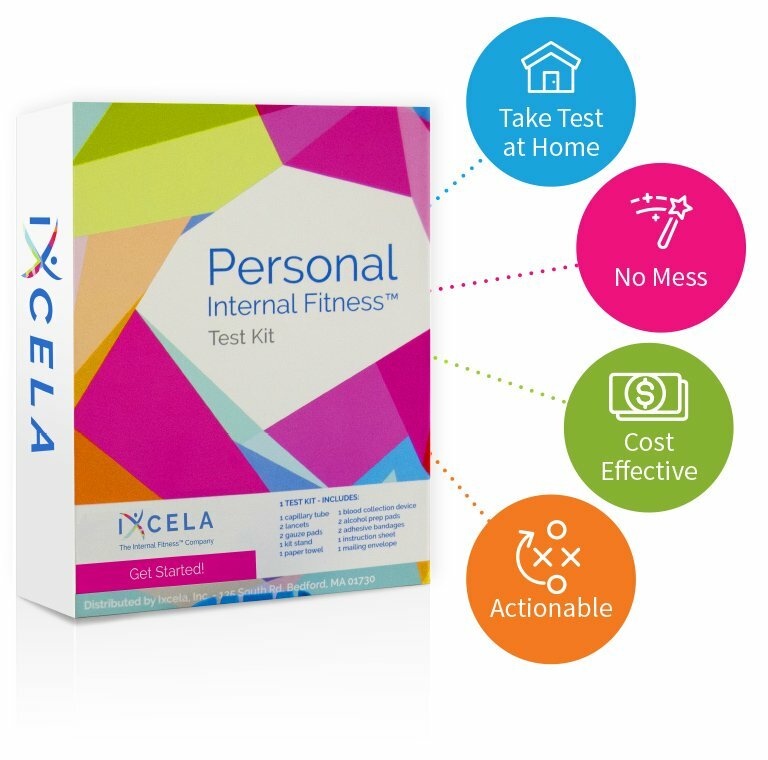 Ixcela has created the world’s first at-home blood test that can help improve internal health. Why does your internal fitness matter? A healthy life starts from within—the gut. 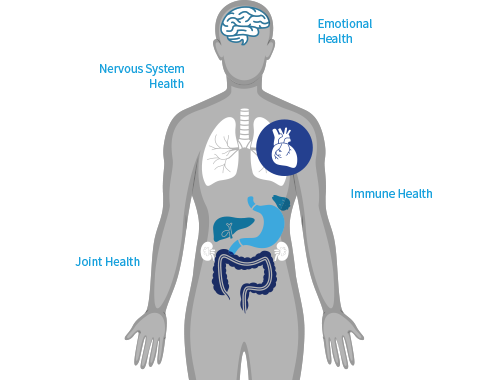 An internal imbalance can contribute to a wide spectrum of health issues. 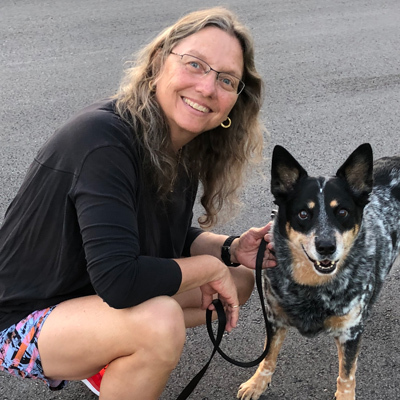 Co-founder and CEO Dr. Erika Ebbel Angle shares why paying attention to your internal fitness matters. ORACLE TEAM USA cuts missed training days by half using Ixcela. Find out how the Ixcela test kit and supplements improved ORACLE TEAM USA athletes’ training schedules. World class fitness expert Craig Macfarlane and nutritionist Scott Tindal speak about food, recipes, fitness, exercise, and how to improve your internal health. Is Ixcela right for you? Are you concerned about your gut health, brain health, or heart health? Imbalances in the gut microbiome have been associated with many health concerns. Nutritional and lifestyle changes can affect your gut health. Our test results, based on your at-home blood test, provide recommendations about which foods and supplements will optimize your health. Are you a high-performing individual whose livelihood depends on being at your best health every day? Whether you’re a professional athlete training for your best performance, or a CEO preparing for a high-stakes presentation, you must be at the top of your game each day. Find out how to best take care of your gut to minimize lost days. Scientists are discovering more about how our gut health impacts everything from skin conditions to mental health. Simple changes to what you eat and how active you are can help improve your gut health. Most people know what a balanced meal looks like, but the struggles arise when it comes time to prepare or better yet be prepared. Small changes to your mealtime routine can make a big impact on the health of your meals and eating habits. Is Flu Shot Effectiveness Determined in Your Gut? Studies have revealed an unappreciated but significant role of the gut microbes in modulating vaccine immunity. In particular, data show that the effectiveness of the flu shot in inducing antibody response and protection is controlled by the gut microbiome. Ixcela is the easiest, cleanest, most cost-effective microbiome test. The Ixcela microbiome test kit is self-contained and shipped directly to your door. After collecting the small pinprick blood sample, send it to us in the prepaid, self-addressed envelope, and we’ll send you your results. 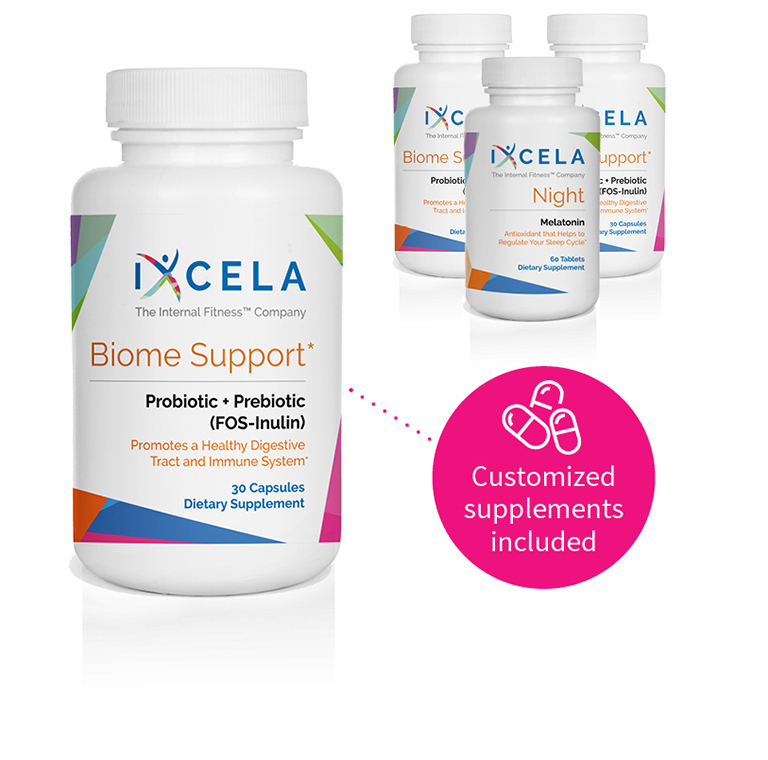 The Ixcela gut microbiome at-home test is easy, clean, and accurate. Curious what the Ixcela microbiome test kit looks like? We can show you! Check out this quick video of how to collect the small pinprick blood sample. Receive actionable guidance on what to do with your results. Once we receive your sample, we analyze the results and create a personalized nutrition, supplement, and fitness plan to help you optimize your health. Going through the Ixcela Complete program has been an amazing journey! I not only met but surpassed all of my health goals and feel great! One thing I would love to share is how impressed I am with Ixcela Biome Support. I have colitis and tried many probiotics over the years but nothing really worked. To my surprise, within a week of taking Ixcela’s Biome Support, I was feeling better. I slowly came off my medication (under my doctor's guidance) and have been symptom-free ever since! Results are delivered directly to your online account within a month. 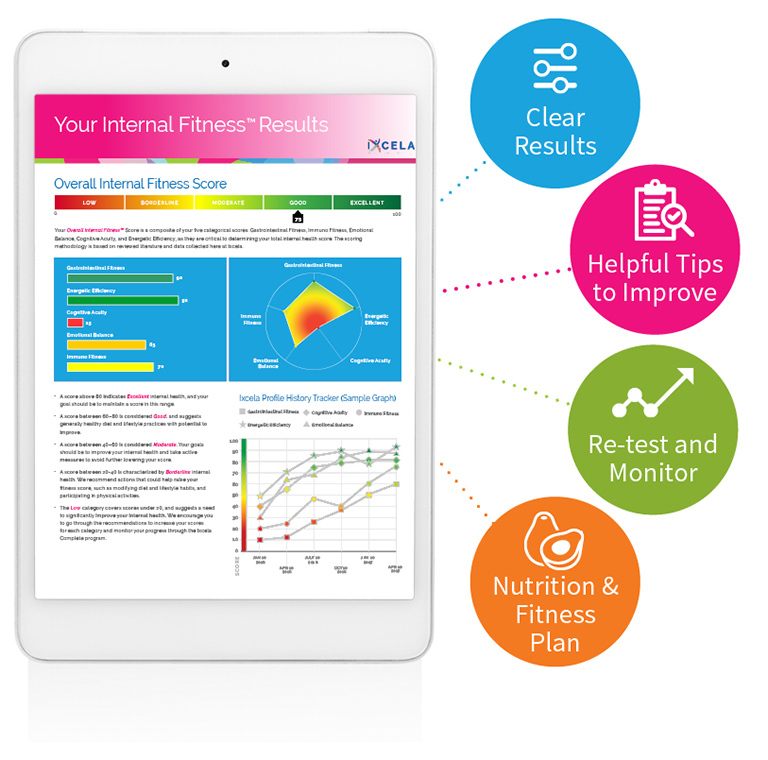 Your Internal FitnessTM results not only include scores in Gastrointestinal Fitness, Immuno Fitness, Emotional Balance, Cognitive Acuity, and Energetic Efficiency, but you’ll also see actionable recommendations on how to improve your scores through nutrition, supplements, and exercise. Our Internal FitnessTM supplements and probiotics are included in our subscription cost and are specifically formulated and customized with dosages for your unique profile. Ixcela supplements are produced at an FDA registered, GMP compliant facility and contain no harmful fillers. They are vegetarian and not tested on animals. Retest to see if your lifestyle and nutritional changes are impacting your gut health. We send you a new test kit every other month to measure progress. 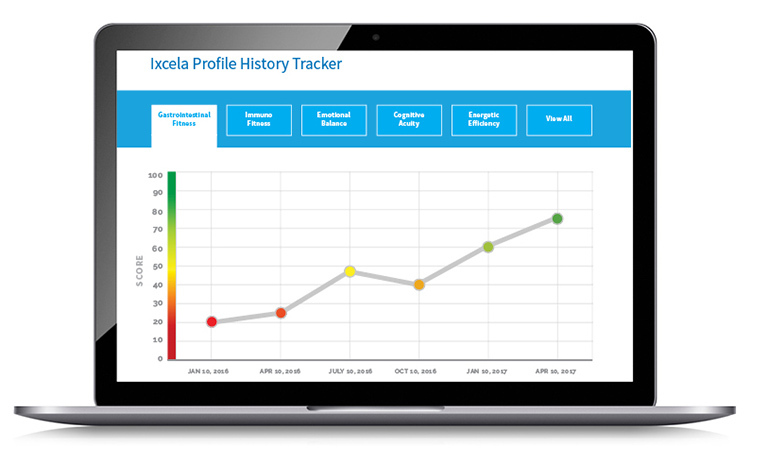 Ixcela updates your profile page and adjusts your monthly regimen for your body’s changing needs. Our test is backed by scientific studies. View relevant references. Buy the Ixcela Internal Fitness™ Program today!